Every year, Art 5 students present solo exhibitions of their work to an audience of friends and family. This is one of the culminating experiences of their art education at MLWGS and gives them a chance to learn about how to put on a gallery show. 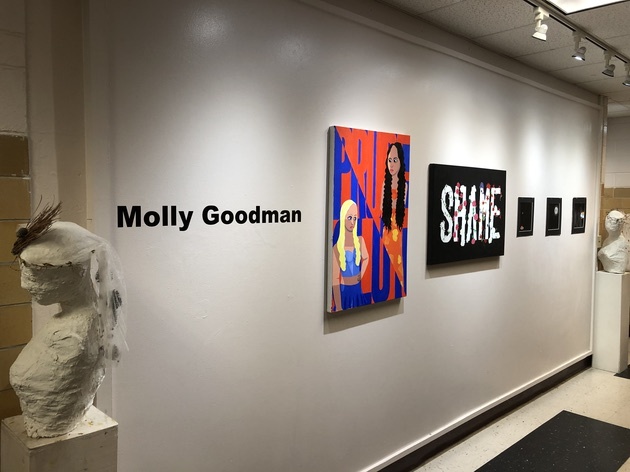 Molly Goodman (’19) gave a great artist’s talk about the evolution of her work and her use of materials as well as the impact of feminism on her art. The Foundation provides a grant to purchase materials for these shows, such as printed invitations and the vinyl lettering seen in this picture.